Heating up your household with bespoke gas fires is not only economical and efficient but also an attractive way to give your space a warm and cosy feeling. This encourages family members and friends to gather around or close to the radiant heat coming from your hearth. However, you should keep in mind that gas is a highly combustible substance and also toxic. Which is why you need to remind and ensure family members have familiarised themselves with how your gas unit works and how to stay safe while using the unit. Moreover, your gas fire should also be professionally maintained at least annually, preferably during the autumn season. Why? So that in the event that there are repairs to be made, these can be finished just right before the cold, bitter winds signal the inevitable arrival of winter. Below, we list down crucial safety tips for you to remember to keep your family safe and still enjoy the warmth of your gas fire. Chances are, you will not be using your gas fireplace during the warmer months. By ensuring the switch is off helps keep the fireplace in good shape and energy costs down. The main thing you need to look out for are gas leaks, which are potentially hazardous to the health of your family. So when you’re not using your fireplace, simply remove the fuel. If you notice cracks on the glass of your gas-fuelled unit or any of its parts, never turn it on. These cracks, no matter how small, could allow gas to leak, which could lead to carbon monoxide poisoning. Also, a damaged thermometer could make it difficult for you to determine whether the fireplace is on or off. Immediately contact your contactor if you notice a malfunction in your unit. Keep all flammable items away from your fireplace, like magazine, newspapers, rugs, pet beds and anything that can ignite if placed too close to the firebox. After your unit has been turned off, avoid touching it for at least an hour or so. Yes, it can still burn even when it is turned off. You need to wait until the unit has cooled down. This goes without saying—never touch your firebox if it is on. The metal parts and the glass are heated, so by touching them, you’re risking burning your skin. Make sure to keep children and also pets from accidentally touching or even brushing the fireplace’s glass front. Manufacturers highly recommend you install a barrier to keep young ones in direct contact with the heated glass. Wait until the unit has completely cooled down before you start cleaning it. Never use water while the glass front is still hot. The glass could crack, allowing gas to escape into the room. You might have done this a couple of times, but keep in mind that a gas fireplace should never be operational unattended. You have to be completely sure that you turned it off before leaving the house. 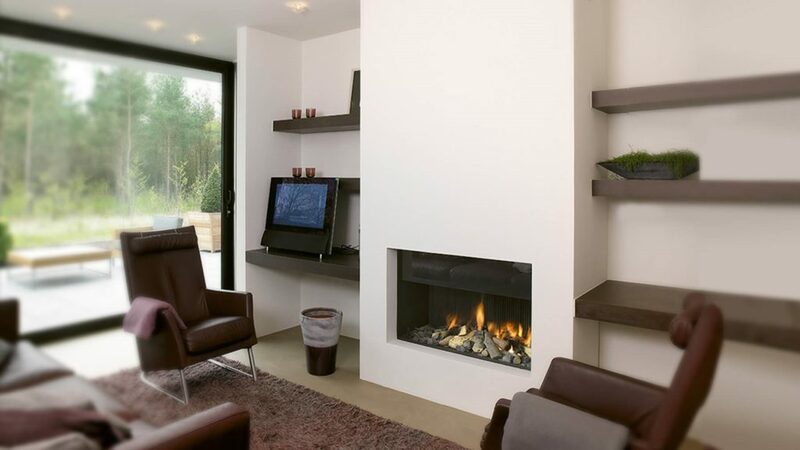 To keep your contemporary gas fires safe and fully functional, an annual maintenance would go a long way. This helps prevent any spontaneous combustion caused by dirt build-up or even gas log set insert degeneration, which could led to indoor air pollution.